Beidh drama ar siúl ar an 7ú lá i mí Feabhra sa Seanscoil Sailearna Connemara. Bíonn na paistí ag clacthadh go dian agus tá siad ar fheabhas. Táimid ag dheanamh alán obair bunaithe ar na Trí Mhuc. Tá suil agam go bhainfidh na páistí alán taitneamh as an dhrama. The drama is on in Connemara on the 7th of February. The children are practicing really hard and are fantastic. 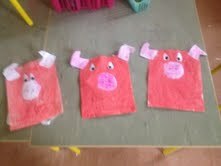 We are doing alot of lovely things about the three little pigs (have a look at our art). 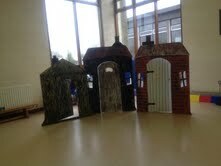 I hope the children enjoy the experience of being on stage and using their well learned Irish.